Hi people I got my sword 7 * lv 70 I was happy but when I went to betow of my old sword lv 60 to my new lv 70 I stayed disappointed,sad and scared because it was;request me;50 bestow stones this is absurd if 20 was too imagine 50... ;40 bestow stone cost 2400 realm gem but nobody has 2400 realm gem every day in Exchange shop 1 bestow stone cost 100 honor and can buy 5 per day but nobody can 500 honor coin per day that\'s kind of nonsense is not it?. I would like everyone to participate in this discussion in order to reach a good solution because there are many unbalanced thing in this game(one of them is Holy Relic epic cost more than 2M to;lv up ATK,CRIt,CDMG and 1.4M to others stats) and it will only cause us we stop to play it game .thanks to atention. Classic cash game maneuver, ;they get you invested in your character and stick you with an expensive solution to a problem. ;Now, you either wait an eternity, or ;pony up the Visa. I suggest you pay them. ;or you don\'t pass the toll bridge! Before put Hallowed Stone I and II to exchange in Realm Shop, really have hard time to accumulate 50 Bestow Stones for One legendary item. But in the end managed to bestow. After Hallowed Stones were added in shop, I\'ve realized using Hallowed Stones method it speed up the time than waiting to collect Bestow Stones as long daily completes Ladder event get enough points. It will not be a waste to old legendary item, you still can Imbune to the new legendary item increasing Lv. faster. There are many ways to reach destination. It take one to decide. That doesn\'t really work so well anymore now oaklane has been badly nerfed since it would take many weeks work to fix the level 60 and 70 imbues again. It\'s days per level between 60 and 70 now, before nerf it used to be possible to do about 1 and a bit;of those a day but oaklane been nerfed to death since then. Wasnt the update supposed to make imbue level 50+ easier but is slow as hell now. 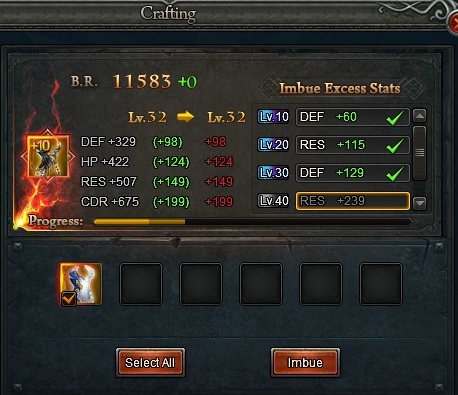 Another Secret Update, Anyways,All Imbue is hard now From level 1 to 40 Is not a easy as they said... They made it all harder, I just got a new equipment yesterday and was shocked of Getting really low percents of items imbuing..
2019-4-22 00:45 GMT+8 , Processed in 0.070797 second(s), 50 queries .